A generic, fitfully funny mainstream comedy that doesn't nearly get the best from its name-brand players but doesn't qualify as a desecration, either. A veritable festival of bad toupees and repeated gags that just lie there, "The Incredible Burt Wonderstone'' runs a bit more than an hour and a half but seems much longer - like it had been edited down at the last minute. 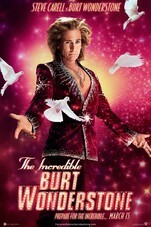 The Incredible Burt Wonderstone isn't.